Actually, I do have that one. He’s still in the package and that picture is well over a year old. You will notice that the Evolutions Fett, McFett, and Holiday Fett are also not there. Yet I do have them all. Ohh! I guess I didn’t notice him you know,I came up with this cool idea of making a picture or POTD of Boba escaping the sarlacc pit.Tell me what you think of it.Oh,the only time I will reply again tody at like 4:00 pr 4:30 after I’m finished with all the work I have to do.Renember tell me what you think of my POTD idea. P.S.The materials you need is clay any Boba Fett I recommend either your SAGA LEDGENDS Boba Fett or your comic pack Boba I,personally recommend your comic pack Boba Fett. i have the boba fett and RA-7 comic pack. Good gag… I like this vintage kick you’ve been on. So what’s the trick for this shot? 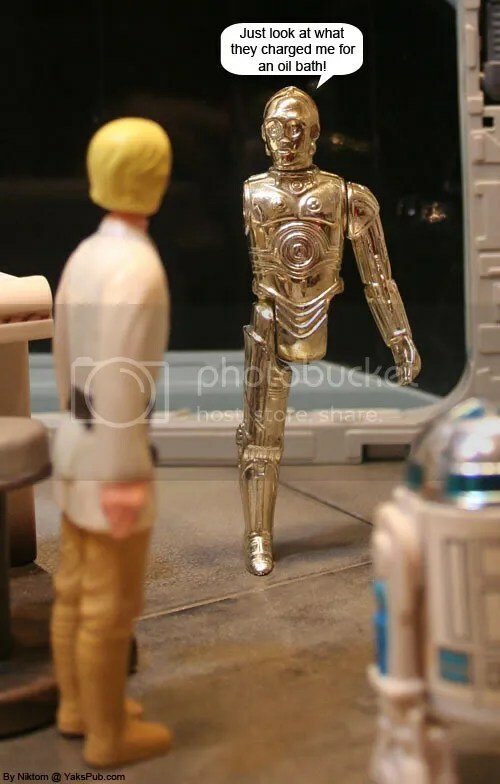 I know you had to ‘paint’ out something that was keeping him vertical, but it almost looks like you used a non-removable limbs Threepio and digitally painted out the entire arm and leg. Thanks Lex! Yea, I’ve gone a while neglecting the Vintage guys so it was time to have a little fun with them. Ahh… magicians never reveal their secrets and that IS a REMOVABLE LIMBS Threepio. I couldn’t imagine the work of digitally removing a whole leg and arm. Who the heck is mcFett?Is he like some old farmer guy?Can someone please tell me. That would be the McQuarrie Concept Fett. Oh,I always forget what those abriviations are I know the POTF and POTF2 abriviations but umm oh yeah whats your favorite Boba variation?